If you went to bed early last night, you will want to watch how the Green Bay Packers-Seattle Seahawks football game ended. Down five with the clock turning to zero, Seahawks QB Russell Wilson heaves a hail-mary pass into the end zone. Several players from both teams go up for it—although one Seahawks receiver pretty clearly pushes a Packers defender to the ground, which should have resulted in an offensive pass interference call that would have made the ball dead and ended the game with a Packers victory. A Packer seems to catch the ball, while a Seahawk quickly grabs hold of it, so that by the time they hit the ground it appears they both have possession—which, according to NFL rules, means that the pass was an interception, which also would have ended the game with a Packers victory. Instead, the two refs on the scene give opposite calls: an immortal moment that you can see in the above image (the ref on the left is signaling touchback, meaning interception; the ref on the right is is signaling touchdown). Eventually, the play is ruled a touchdown. Seahawks win. The play came at the end of a game, and a weekend, characterized by increasingly poor officiating by the replacement referees, whom the league hired after it locked out its referees union because they failed to come to a new collective bargaining agreement. The replacements are an embarrassment (we’ve long known some of them previously served in the Lingerie Football League; we now know some of them were fired by the Lingerie Football League). Though the referees union and the league are only separated by something like $50 million, the league has a point when it asks, for example, that the referees move from a penson to a 401(k) as other league employees have. When I spoke to him yesterday, Peter Carfagna, who lectures on sports law at Harvard Law School, said that he felt both sides had plenty of room for compromise and that a good mediator would be able to broker a deal in very little time. Indeed, a federal mediator is now involved. But all that is secondary to the Great God of Public Opinion, which has just given the professional refs all the leverage it could. After last night’s prominent outrage, it beggars belief that the real refs will not be back by Sunday’s games. They, too, will be imperfect. But they will be better, and they will be more professional, and they will possess a certain authority—a kind of charisma, really—that will make the game no longer seem as fifth-rate as it has the past couple of weeks. If they don’t reach this deal, then on the grounds of workers’ rights as well as quality of the product you’re being served, you should strongly consider withholding your viewership. Before the deal gets done and we stop talking about this and start talking about other things (Matthew Stafford’s injured again! Michael Vick might lose the starting job! The Arizona Cardinals are really good! ), a few reflections on Refgate. 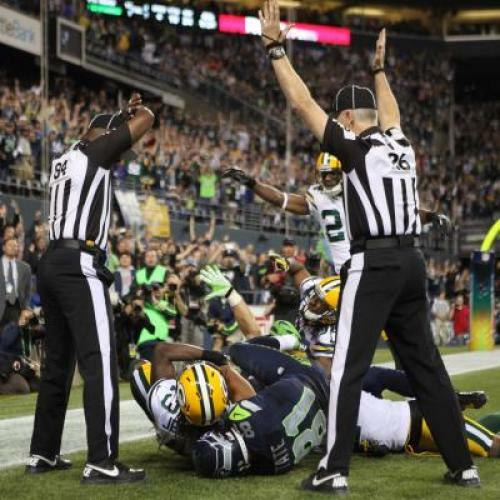 • Last night’s call was not the worst call the replacement refs (“scabs” one wants to call them) have made. Sunday, for example, they permitted the San Francisco 49ers to make two challenges despite the fact that the Niners had no timeouts left, even though one must have a timeout when making a challenge—an inarguable screw-up. And there have been too many instances of phantom interferences, penalties assigned to the wrong players, and just general incompetence to count. Nor was it, necessarily, the only bad call they have made that decided a game—it was just the first to come literally on a decisive final play. • Typically, the home team wins a little more than 50 percent of the time. This season, the home team is 31-17. In L. Jon Wertheim and Tobias J. Moskowitz’ book Scorecasting, the authors study home-field advantage and conclude that it is due almost exclusively to the officiating. Preliminary conclusion: the replacements are intimidated by the fans and giving the home teams more calls. Do I even need to tell you last night’s game was in Seattle? • On Sunday, the players union released a statement calling on the owners to end the lockout. While it focused on player safety and “the integrity of the game,” it also included this crucial sentence: “Your actions are looking more and more like simple greed.” Solidarity! • Speaking of player safety: Oakland Raiders receiver Darius Heyward-Bey was briefly hospitalized for a concussion after sustaining an illegal helmet-to-helmet hit that the replacements did not flag. One replacement tripped a player with his hat (a referee throws his hat if he has already thrown his flag). The player safety stuff is not just pious lip service. • Read the players’ statement again. It is addressed to “Owners of NFL Teams” and uses the construction, “allow your Commissioner.” Commissioner Roger Goodell, the go-to villain in this saga, is not blameless, but nor is he the main wrongdoer. He, too, is an employee of the owners. Until he or she says otherwise, it is fair to assume that all owners—not just the usual evil suspects—are against restoring the integrity of the game by paying a piddling amount to their unionized employees in favor of hiring scabs to make a hash of their product. • The players had remained relatively silent—until late last night, when a few took to Twitter (and one, the Pundit Punter Chris Kluwe, took to Deadspin) to express their outrage. The reason for this, Harvard’s Carfagna suggested, is that their collective barganing agreement—itself negotiated under the cloud of a lockout—bars them from speaking out. (This is also, he suggested, why they can’t threaten a solidarity strike.) A quick look reveals that, in the same paragraph that discusses taking bribes, the CBA stipulates that if a player “is guilty of any other form of conduct reasonably judged by the League Commissioner to be detrimental to the League or professional football, the Commissioner will have the right” to fine, suspend, or expel the player. Goodell rules by fiat. Last night, Packers guard T.J. Lang tweeted his frustration with the call and then acknowledged he would probably be fined. Please understand that there is little difference between this situation and that of anonymous officeworkers across the country who are similarly denied free speech by their employers, and that if Lang is fined, the league will have demonstrated it is more committed to dividing and conquering its employees than to satisfying its consumers. Which is to say, please understand that this is not just about football.